Founder of a Samaritan sect; lived probably in the first century of the common era. According to Pseudo-Tertullian ("Adversus Omnes Hæreses," i. ), he was the first to deny the Prophets—a heresy that gave rise to the party of the Sadducees. Jerome gives the same account ("Contra Luciferianos," xxiii.). Hippolytus I. begins his enumeration of the thirty-two heresies by mentioning Dositheus; hence this sect is made to appear older than the Sadducees (compare Clement of Rome, "Recognitiones," i. 54), and on this heresy is based the system of Philaster ("De Hæesibus," §§ 4, 5). The Samaritan chronicler Abu al-Fatḥ of the fourteenth century, who used reliable native sources, places the origin of the Dosithean sect in the time before Alexander the Great (Abu al-Fath," Annales," ed. E. Vilmar, 1865, p. 82). The rabbinical sources also (Tan., Wayesheb, 2; Pirḳe R. El. xxxviii.) contain obscure references to Dositheus and Sabbæus as the two founders respectively of the Samaritan sects of the Dositheans and Sabuæans (compare Epiphanius, Hæres." 11, 12, 13 ). These have been identified with the Samaritans Sabbæeus and Theodosius, of whom Josephus relates ("Ant." xiii. 3, § 4; compare "Chronicon Paschale," in Migne, "Patrologiæ," Greek series, xcii. 441) that they defended before the Egyptian king Ptolemæus Philometor, against Andronicus, the advocate of the Jews, the sanctity of Mt. Gerizim (Grätz, "Gesch." 4th ed., iii. 45). The Samaritan chronicles (the Book of Joshua and Abu al-Fath's "Annales") recount a similar discussion between Zerubbabel and Sanballat. As Josephus says that the Samaritans had two advocates, he doubtless meant the two apostles Dositheus and Sabbæus, whose doctrine—including the sanctity of Mt. Gerizim, rejection of the prophetical books of the Old Testament, and denial of the resurrection—was on the whole identical with that of the Samaritans. According to Hegesippus (Eusebius, "Hist. Eccl." iv. 22, § 5), Dositheus lived later than Simon Magus, the first heresiarch of the Church; other authors speak of him as the teacher of Simon (Clement of Rome, l.c. ii. 8; several passages in Origen; Epiphanius, l.c. ), at the same time confounding him with Simon. Magus, connecting his name with Helena, and stating that he was the "being" (ἑστώς = "stans"). Origen says that Dositheus pretended to be the Christ (Messiah), applying Deut. xviii. 15 to himself, and he compares him with Theudas and Judas the Galilean (see "Contra Celsum," i. 57, vi. 11; in Matth. Comm. ser. xxxiii. ; "Homil." xxv. in Lucam; "De Principiis," iv. 17). Origen also says that Dositheus' disciples pretended to possess books by him, and related concerning him that he never suffered death, but was still alive ("In Joann." xiii. 27). To this must be compared the story of Epiphanius ("Hæres." 13) regarding his death by starvation in a cave. Epiphanius adds that while some of the Dositheans lead loose lives, others preserve a rigid morality, refrain from the use of meat, observe the rite of circumcision, and are very strict in keeping the Sabbath and in observing the laws of Levitical purity. These statements may, however, refer to another Dositheus, who belonged to the Encratites (Harnack, "Gesch. der Altchristlichen Litteratur bis Eusebius," i. 152, Leipsic, 1893). Origen says ("Contra Celsum," vi. 11) that the Dositheans were never in a flourishing state, and that in his time they had almost entirely disappeared, scarcely thirty of them being left. The Midrash, however, speaks of Dositheans, with whom Rabbi Meïr had dealings (Pesiḳ., ed. Buber, 59b. Pesiḳ. R. 16; Midr. Mishle xiii. 25, Yalḳuṭ § 950), and two names, "Dosion and Dosthion," are also mentioned (Ab. R. N., ed. Schechter, p. 37; compare "Shibbole ha-Leḳeṭ," ed. Buber, p. 266), which either refer to two Dosithean sectarians or form a double designation for the heretic Dositheus. 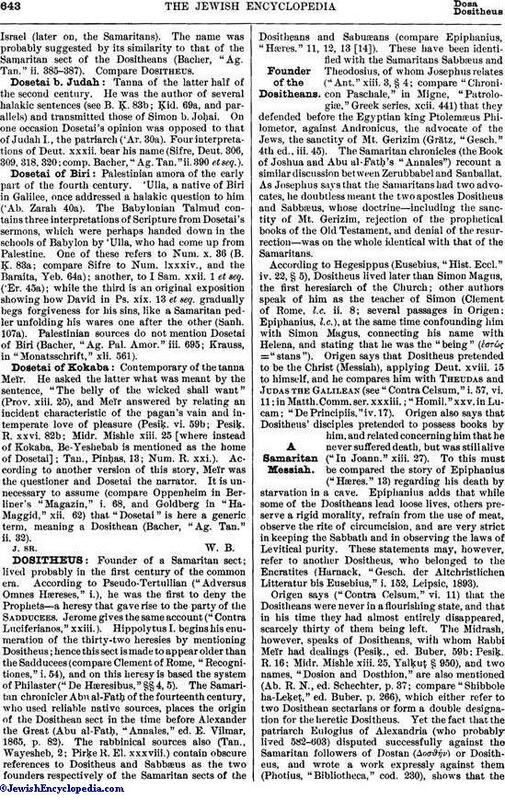 Yet the fact that the patriarch Eulogius of Alexandria (who probably lived 582-603) disputed successfully against the Samaritan followers of Dostan (Δοσϑήν) or Dositheus, and wrote a work expressly against them (Photius, "Bibliotheca," cod. 230), shows that theDositheans existed and even exercised a certain power in the sixth century. Origen possibly refers to a Christian sect of the Dositheans, who in fact left no traces, while the Samaritan sect certainly continued to exist. In Egypt especially, this sect was probably numerous enough to induce the Christian patriarch of Alexandria to engage in polemics against it. 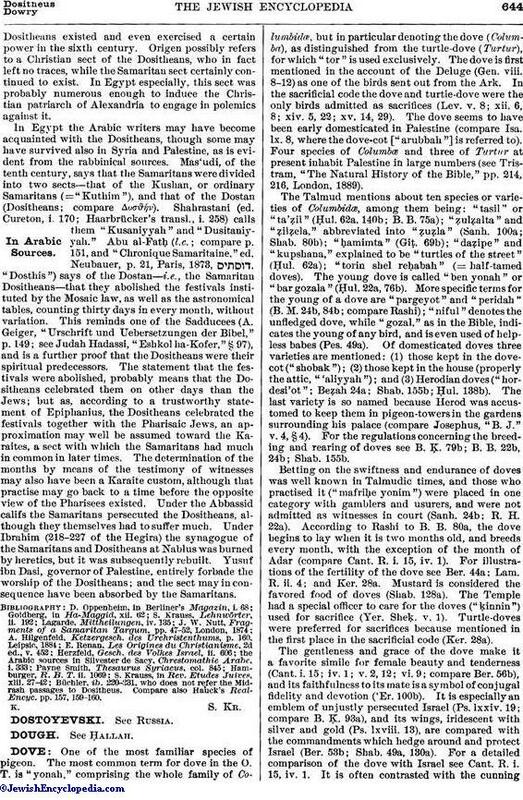 In Egypt the Arabic writers may have become acquainted with the Dositheans, though some may have survived also in Syria and Palestine, as is evident from the rabbinical sources. Mas'udi, of the tenth century, says that the Samaritans were divided into two sects—that of the Kushan, or ordinary Samaritans (="Kuthim"), and that of the Dostan (Dositheans; compare Δοσϑήν). Shahrastani (ed. Cureton, i 170; Haarbrücker's transl., i. 258) calls them "Kusaniyyah" and "Dusitaniyyah." Abu al-Fatḥ (l.c. ; compare p. 151, and "Chronique Samaritaine," ed. Neubauer, p. 21, Paris, 1873, , "Dosthis") says of the Dostan—i.e., the Samaritan Dositheans—that they abolished the festivals instituted by the Mosaic law, as well as the astronomical tables, counting thirty days in every month, without variation. This reminds one of the Sadducees (A. Geiger, "Urschrift und Uebersetzungen der Bibel," p. 149; see Judah Hadassi, "Eshkol ha-Kofer," § 97), and is a further proof that the Dositheaus were their spiritual predecessors. The statement that the festivals were abolished, probably means that the Dositheans celebrated them on other days than the Jews; but as, according to a trustworthy statement of Epiphanius, the Dositheans celebrated the festivals together with the Pharisaic Jews, an approximation may well be assumed toward the Karaites, a sect with which the Samaritans had much in common in later times. The determination of the months by means of the testimony of witnesses may also have been a Karaite custom, although that practise may go back to a time before the opposite view of the Pharisees existed. Under the Abbassid califs the Samaritans persecuted the Dositheans, although they themselves had to suffer much. Under Ibrahim (218-227 of the Hegira) the synagogue of the Samaritans and Dositheans at Nablus was burned by heretics, but it was subsequently rebuilt. Yusuf ibn Dasi, governor of Palestine, entirely forbade the worship of the Dositheans; and the sect may in consequence have been absorbed by the Samaritans. Büchler. ib. 220-231, who does not refer the Midrash passages to Dositheus. Compare also Hauek's Real-Encyc. pp. 157, 159-160.